UPND Lusaka Province Chairperson, Obvious Mwaliteta says the PF should take the blame for the current numerous economic problems facing the country today and not maliciously blame it on HH and GBM. Mr Mwaliteta said the PF should realise that Zambia is a country with a sincere and patriotic citizenry which deserve to be respected and not taken for granted. “Zambians are sincere and very patriotic and its an insult for PF to think that they can be pushed and ordered what to do they way they do with their hired cadres. PF should not take Zambians for granted,” said Mwaliteta. He said Patriotic Front governments’ failure to pay attention to people’s needs has contributed to so many issues affecting Zambians today. He said the Patriotic Front need to know that food and land is security for the Zambian people and added that it is the duty of the UPND in opposition to provide checks and balances by speaking on behalf of the people. Mr Mwaliteta has called on the PF to conduct a survey on why Zambians are protesting and stop the blame game as that further reduces its governance credentials. He also warned the PF to stay away from its unwarranted attacks and schemes to create “false” charges against HH and GBM because that will not be tolerated by the Party and its supporters across the country. 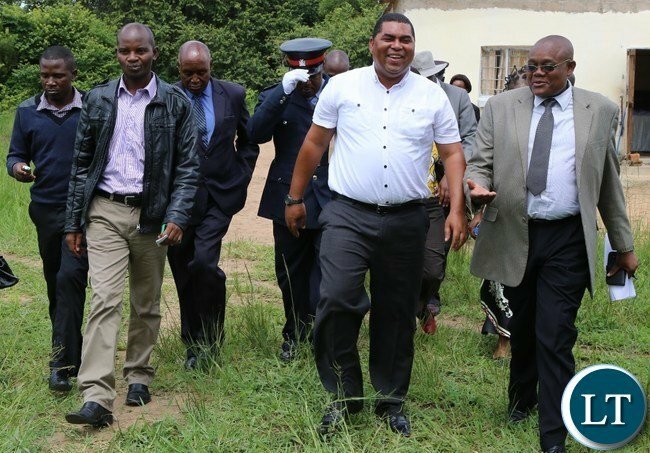 Speaking when he featured on a programme dubbed “Unscripted” on Muvi TV last evening, the former Kafue lawmaker observed that the PF has become so obsessed with the UPND and its leadership thus accusing it for their wrongs. “Look at the numerous unfinished projects under the PF regime such as the Katunda-to-Lukulu road and the Kaoma-to-Solwezi road! Look at the high levels of corruption in the country and the failure by the Government to address the challenge of meagre salaries for civil servants. Is it HH and GBM, the answer in NO,” said Mr Mwaliteta. He said the UPND will utilise the countrys’ resources to create wealth and descent jobs for the ordinary citizenry and not those in government immediately it forms government. Mr Mwaliteta said it is high time the PF called for early elections if they realised that the opposition had become “bigger” than them. The UPND Lusaka strongman said the party and it’s leadership are not in charge of both the country and ZAFFICO whose alleged sale sparked riots in a number of townships on the Copper Belt. He said the PF needed to clarify issues surrounding the alleged sell of ZAFICCO and not “keep lying to Zambians even when most of their lies were there for all to see”. Thank you mwaliteta…..you are indeed a UPND strongman. Keep asking them how HH can influence a PF stronghold to riot while lungu was in the province ? Only a f00l believes what PF says. Time and again I have always said what ever PF says the direct opposite is the truth. PF top leaders have sworn seeds of discontent among honest hard working Zambians because of their obsession with getting rich quick via stealing public money. This has inturn led people feeling abandoned hungry and angry. PF has run down all the sectors of the Zambian economy and this is making people angrier by the day. Its just one day when the whole country will rise against PF. and demand its removal. I can predict this as the day PF will arrest GBM and HH. Lungu dont say I never warned you. It is a pit that Mwaliteta didn’t have Grade 12 certificate to defend his MP seat. He is a tough politician. I think by now he should have written exams. Mwaliteta is a big personality, actually even bigger than Ka Lungu, Chakolwa. The man can even make a good candidate for President than HH. He could sweep ka Lungu away on the side and be the next big thing for Zambia in 2021. He looks presidential and he has bee initiated in Prison like most great African Leaders. I just have a feeling Zambia is looking at their MAN!!! Is Mwaliteta TONGA, or something? He sounds like he is practicing regional politics like the rest of them UPND. We all know PF were using aid money from donners disguised as social cash transfers to bribe voters ……now donner aid in that regard is stoped let’s see…. These ballots you keep on stuffing, 3000 registered voters you get 4500 votes. I’m neither a Upendi supporter nor PF supporter but Mr Mwaliteta make lots of sense.Let’s all support good ideas based on principle of what is best for Zambia coz country comes 1st then political party 2nd.Everyone has to swallow some pride at some point. Tell us how ZNBC is 100 % Zambian but 60 % Chinese controlled and 40 % GRZ controlled ????? HH was given 1,000 hectares of land in NAMWALA by his tribal chiefs. Is that 100% of land? A Joint venture where the Chinese controll everything worth value at ZNBC ??? The Chinese control carriage fees, set top box sales, mast rental space, advertising revenues , tell us what is left that you call ZANBC ?? Those 5 broadcast vans ?? IMF warnings , Fitch downgrades ,revised budgets ,debt bailout talks ,low economic growth numbers and dwindling forex reserves….yes Bwana Mwaliteta makes lots of sense. If a body downgrades Zambia, UPND INCOMPOS are agreeable if the body upgrades, the TRIBAL INCOMPOS H-a not agreeable, they question the criteria used! ANIMO FARM! He makes sense, the current govt has failed due to luck of leadership, the thieving debarred fyimo fyimo has no clue what he should be doing to stare the ship clear of the ice berg, we are heading for disaster with this lot, PF cadres don’t see any thing wrong because most of them are kaponya`s and the economy is too complicated for them to understand, their leader can`t under stand budgeting what do you expect from his followers, they just follow blindly, to them the 42 wheel barrows were bought at a discount and it is ok for thieving debarred fyimo fyimo to purchase a jet during austerity measures. So trying to convince people with such a low IQ is quiet difficult. At 50+ years Zambians have learnt how selfish, blatant liers , however blood thirsty and in human majority politicians can be. No wonder most elections are characterised by apathy . So, those who feel have genuine agenda to fix Zambia’s problems must not speak in tongues about their visions for this country. Even divine visions in bible times were explained in clear terms to the people. If honestly truthful, why fear to put your head on the block? There are twisting tongues , Agenda is not above board so far. If he was PF he was not going to make sense. Now that he is with Spaka, he makes a lot of sense. Kambwili died and when he came back from the dead in form of NDC consultant, all his were buried with his old PF body. ..even his appearing in court for the same accusations labeled against him by Upnd have become political victimization. As long as we support people with felony records just because they are against the ruling. …not just PF. ..any party in poor, we shall continue moving in circles. My brother even if you will refuse i. Don’t insult just make your point. More than 95% of your claims none has materialized into anything sensible. Don’t insult PF speak to the voter’s who are seeing what is happening. Just been following the events on the USA midterm elections and two things caught my eye. 1) In the State of Georgia governor Kent introduced a system that makes it almost impossible for non white Americans. ..these mostly vote for the Dems. 2) CNN reporter Acosta has been banned from attending White House press briefs on instructions from President Trump. My worry is that if an African country did that it is bad governance. Well America is America. Senseless debates based on hearsay. I do not understand how it would make someone happy to see demonstrations that culminate into damage of innocent people’s property and sometimes including loss of lives. A leader leads by example. If the one instigating the troubles is to be worthy called a leader he should have been with them as they demonstrated. Do not accept to be used as a dummy while his children are busy studying and himself enjoying a cup of chibwantu at home. Ask yourself where you derive your happiness from in this act. Is it the injured people or indeed the stealing? Shame on you who are celebrating this act and particularly Mwaliteta. Your reaction is not impressive. It pains me to see people doing the blame game on such issues because all of us have ONLY one life which is put at risk by those that want to be or maintain power to govern. The battle ground is supposed to be the National assembly and not the streets where ultimately the innocent are affected. Most if not all the time I see these MPs absent minded as debate goes on in the house and then they want to use “civilians” to fight for them. Pardon me if the way I have arranged the words is provocative or just too strong to others. I just DO NOT like doing evil to others. Yes ba grade nine it’s PF to shoulder the blame. But one thing you don’t realise is that you he-goat does influence certain reactions in the country be economic or politics because he is a politician. What he says people will buy it. Have you forgotten that the man was put against the conner to substantial allegations against Sudan? He can equally be blamed for the whoes. He has been unpatriotic since elections. Even security guards can speak for upnd and under five trib.al Hacks? I have no comment on grade seven.foo.ls. I for one i dont understand why we like fooling other people what makes mwaliteta to be called strongman in upnd is it because hes a chain smoker or because he was arrested or maybe there is something we should understand more about mwaliteta?